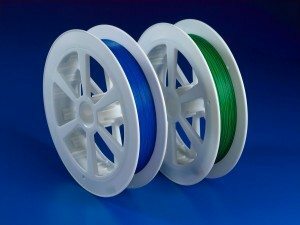 Located in Walldorf, Germany, Polymicro Technologies, a subsidiary of Molex Incorporated, has extended its Specialty Optical Fibre offering with the introduction of FBPI optical fibre and Hollow Silica Wavelength fibre products. Optimised for near infrared (NIR) attenuation and ultraviolet (UV) solarisation resistance to improve transmission over a wider spectral range, Polymicro silica-based FBPI optical fibre delivers industry-first panoramic spectroscopy and sensor analysis. Available in a range of core diameters from 50-600 ?m, broad spectrum FBPI optical fibre with a low -OH pure silica core demonstrates significantly reduced content of UV defects and other UV absorption centres. In the near-infrared (NIR) wavelength region to beyond 2100 nm, Polymicro FBPI fibre attenuation is equivalent to standard NIR fibres having a low -OH silica core and F-doped cladding. Comparable to solarisation properties of standard UV optimised high -OH fibres with high radiation resistance, FBPI fibre features UV transmission down to 200 nm. Strong and flexible Polymicro Hollow Silica Wavelength (HSW) fibre for CO2 laser delivery can be optimised for wavelengths in the infrared (IR) region from 3-20 ?m for a range of applications, including replacement for high cost, heavy, rigid articulated arms in medical and dental laser applications, industrial cutting, and laser printing and marking. Enabling high laser power delivery ?100W, the hollow construction silica simplifies end termination, reduces abrasion and provides a robust buffer in harsh environments. The geometry of the biocompatible fibre can be easily changed to accommodate part customisation. Available with custom buffers, HSW fibre features removable, reusable Poly-Lok™ connectors ideal for prototyping. This entry was posted in Cable & Wiring, Cable & Wiring, Europe, Global, On Ticker, top articles, UK. Bookmark the permalink.